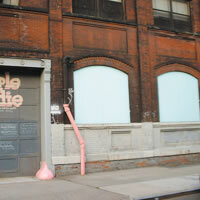 From a distance, Leibowitz's dyptich mural appeared to be blank, or rather, as two side-by-side light blue monochrome "paintings". Many a passerby mistook them as such. But standing on the sidewalk below them, one could make out faint words on each panel. 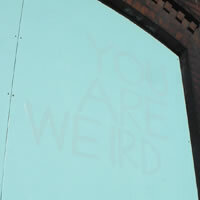 Hand-painted in a low-contrast lavendar, the left panel read "You Are Weird" while the right panel retored, "No You Are". The apparent dispute between two "subjects" that appear to be identical was sly. In a general sense, the work could be a commentary on how people are more alike than they are different, and the absurdity engendered by focusing on difference. More specifically, they may have alluded to Triple Candie (a gallery run by a white couple in a black neighborhood) or Cary Leibowitz (a white gay man living in a very conservative neighborhood). These murals were painted by Cary Leibowitz. They were destroyed when they were deinstalled in April 2005.